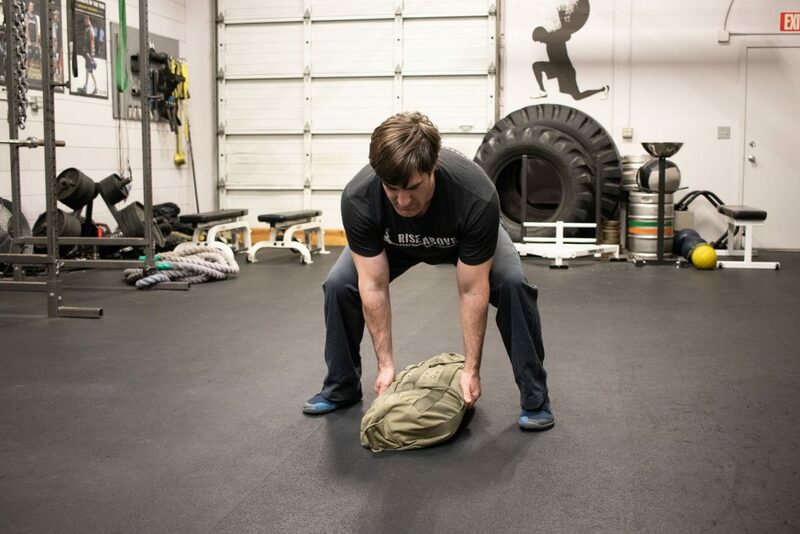 With the athlete and weekend warrior constantly looking for different forms of training to get the most out of themselves one simple tool can check a lot of boxes; the sandbag. In this article and video, I am going to show you how to make Sandbag Training a part of your regimen to increase your strength, power and conditioning development. There is also a circuit training workout at the end to get you started. Sandbags are cheap in comparison to sets of weights, dumbbells and kettlebells. 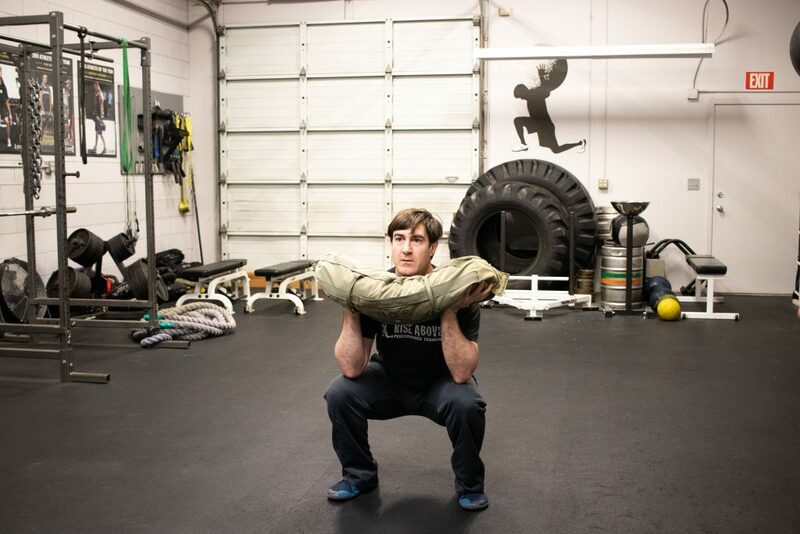 When I first made my sandbags to use at my gym I used a heavy duty duffle bag from an army surplus store, some trash compactor bags, duct tape, and sand all of which you could get at the local hardware store. Fill a few trash compactor bags with 15-20lbs of sand, tape them up so they are compact, and then place them in the duffel bag and you are ready to go. Over the years I upgraded to dedicated sandbags and substituted the sand for small gravel as I found them not to leak and cause a mess as use increased. 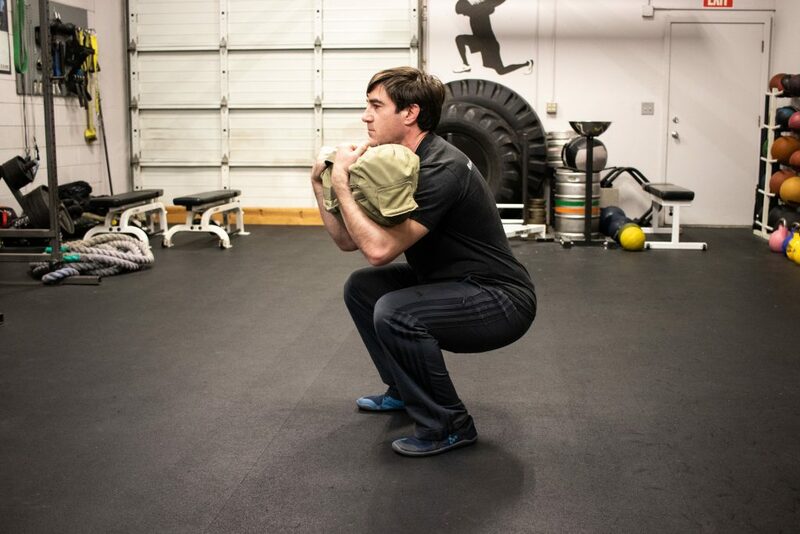 Sandbags can be used to train both power and stability and two of the fundamental exercises I incorporate into my athletes’ programs are the Sandbag Squats and Lunges. 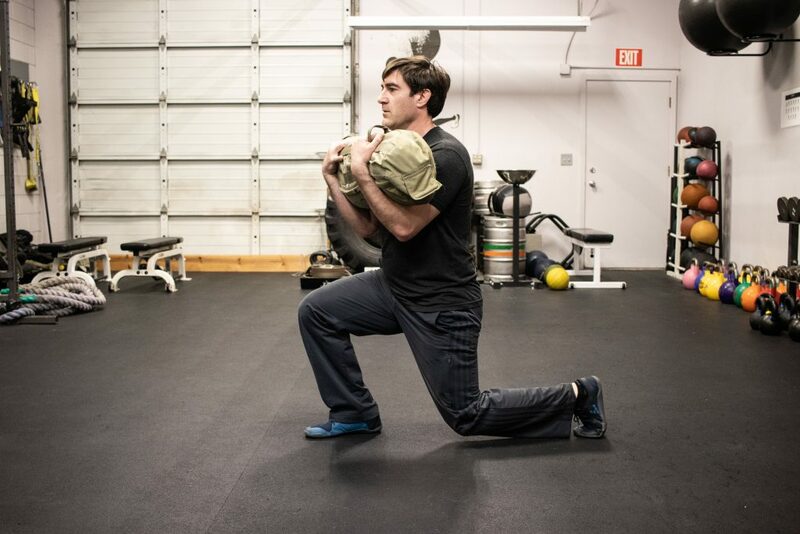 To perform either of these movements I like to hold the sandbag in front of me or have it in the Zercher position. To achieve the Zercher position, simply hold the sandbag in front of you in the crux of your arms. These positions can be safer by taking the pressure of the weight off of your spine; however, it could be more challenging on the core muscles because you need to keep the body upright because the weight wants to pull you forward. To perform the squat, keep your chest up, eyes forward and break at the hips and sit back into the squat. When you get a stretch in the hips and leg muscles, squeeze your leg muscles, drive your feet through the floor and stand up strong until the hips are underneath you. 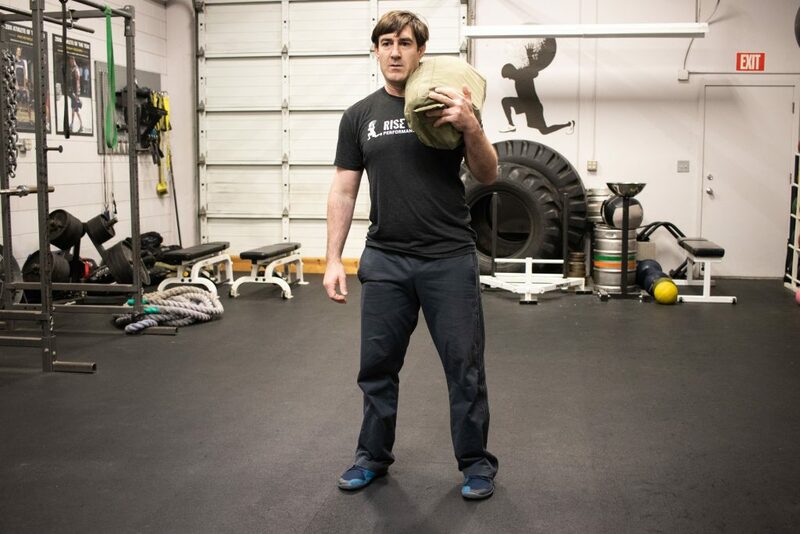 The Sandbag Zercher Lunge can be done in either a forward or reverse direction. Whether you are stepping forward or backward you want an approximate 90-degree bend in your hips and knees, even weight distribution between legs and balanced between sides. Focus on stability through strong core and hips. One of my favorite ways to utilize sandbag training is to use it for power production. One simple way to accomplish this is with Sandbag Shouldering. 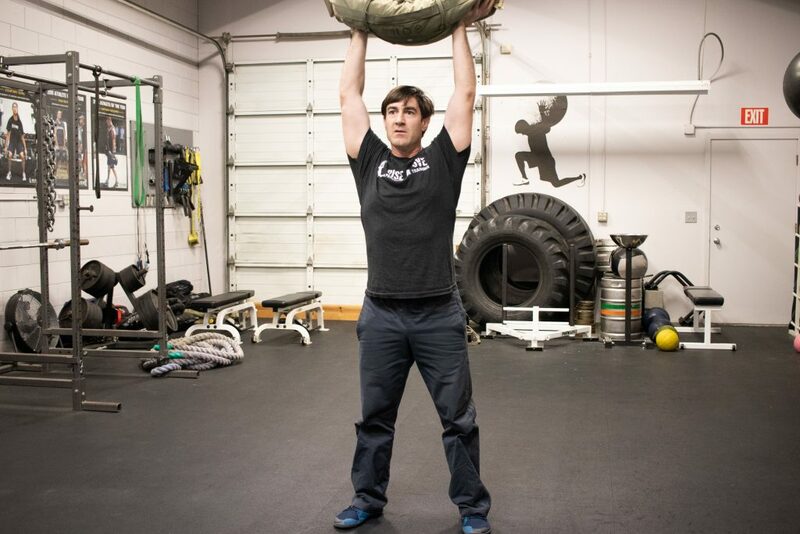 Sandbag Shouldering relies on grip strength, leg drive, core stability and explosive power. Simply place your sandbag vertically and straddle it, get a good grip, flatten your back and drive from your legs moving the sandbag close to the body and up to one of your shoulders. 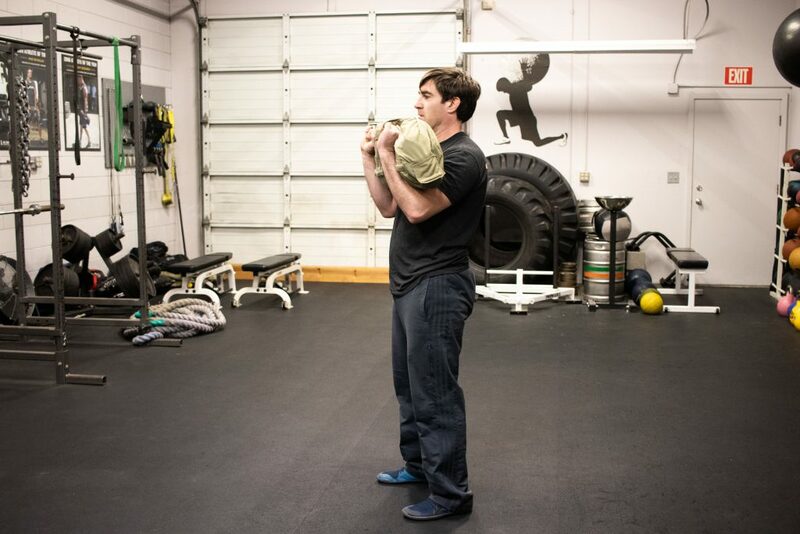 Drop the sandbag back to the floor and repeat to the opposite shoulder. Transferring power from the legs through the whole body can easily be achieved with Sandbag Thrusters. The Thruster (squat to press) is a great way to train the hips to generate power and transfer the power through the upper body. This is much like the Zercher Squat but you have to get your hand under the bag. Upon completing the squat you are going to use the hip drive momentum to press the sandbag overhead. Drop the bag back to the chest and repeat the squat-to- press motion. Another full-body power development lift is the Sandbag Burpees which not only helps lower body strength but it correlates directly to the upper body strength. To perform the Sandbag Burpees start with the sandbag on the ground, use your legs and get the sandbag to your chest in an explosive fashion. 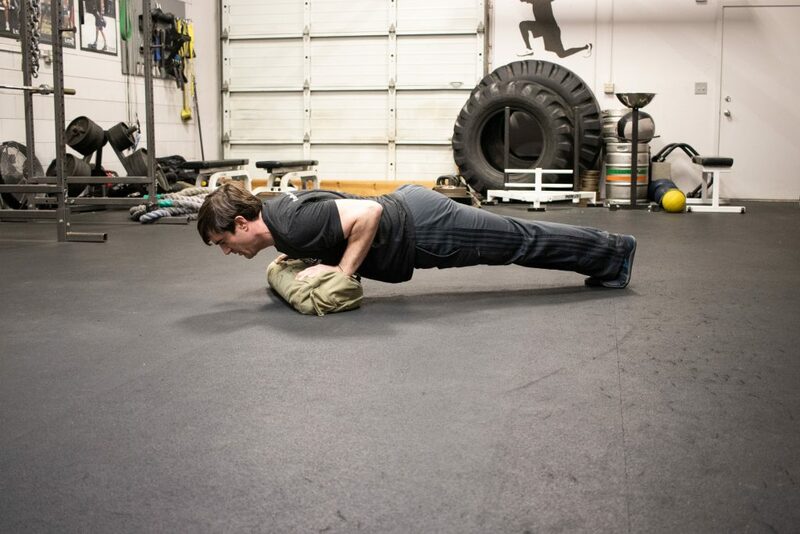 Drop the sandbag to the floor and follow it with your body into a pushup position. Explode out of the pushup position and repeat. There you have some of my favorite sandbag exercises for strength and power development. Check out the video below for visual descriptions of what I mentioned above. Also check out the workout below that takes the above exercises and puts them into a conditioning circuit using time intervals. This is a large circuit guaranteed to get your heart rate up. Each exercise should be done for 30-45 seconds and rest 15-20 seconds in between. Perform this whole circuit two to three times with a one to three minute rest between rounds.